Inspired by Gazzetta dello Sport, here are the performances of all Italian soccer players operating in foreign European leagues (top divisions only). 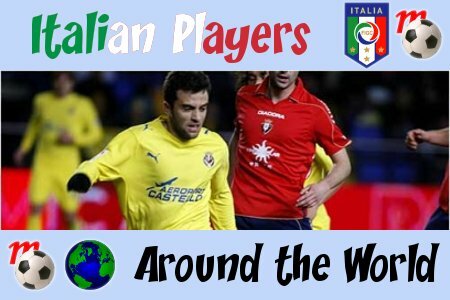 There are currently 32 Italians playing in first divisions abroad, and 12 of them stepped on the field this week-end. With Toni taking his long German Winter break, who else but Joe Red could have taken care of our weekly scoring segment, mmmh? I don’t know long it’s going to take Giuseppe Rossi to join a big club, but what’s for certain is that he’s on the right path. After earning the confidence of Marcello Lippi and securing a spot in the Azzurri, it’s only a matter of time before the European greats come knocking at Villarreal’s door. With this week-end’s performance against Osasuna (just watch this beauty), Joe Red ups his goaltotal to 9. Unfortunately the goal wasn’t enough to give the Yellow Submarine the win. Okay, so the Bundesliga won’t resume until February, but there’s still plenty of Luca Toni-related stuff to keep us entertained. Like this musical ode/theme song, made by a Bayern fan with way too much time on his hands. It grows on you I swear! I have to listen to it at least 2-3 times a day now. (Hat tip to Francesco for the find). This entry was posted on Tuesday, January 27th, 2009 at 9:58 pm	and is filed under Italian Players Around the World. You can follow any responses to this entry through the RSS 2.0 feed. Both comments and pings are currently closed. Correction: the Luca Toni song wasn’t made by a fan, but a German TV personality which apparently does more than sing about our favorite Italian striker. He likes to impersonate him too!